Café Décaféiné or Un Déca: Decaffeinated espresso. À Emporter: To go. Coffee to go is most likely not available at your average corner café. If you’re in a rush, you can shoot your espresso at the bar. Cafés are meant to be social spaces where one lingers. Most specialty coffee shops, however, will have to go cups available. Flat White: An Aussie import. Similar to a cappuccino but with a thinner, more velvety foam that is incorporated into the drink instead of floating on top. Made with flat, non-aerated milk. Cortado: Espresso cut with a small amount of milk that has been added after the espresso. V60: A manual pour-over coffee dripper used to make filtered coffee. Chemex: A glass coffee dripper with a conical neck also used to make pour-over filtered coffee. 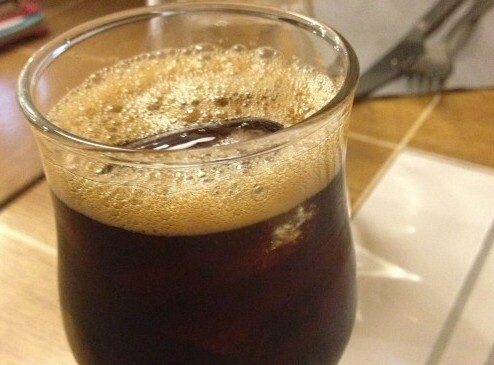 Café Glacé: Iced coffee. Hard to come by. Extraction à Froid: Cold-brewed. Naturally sweeter and higher in caffeine. Not necessarily served iced. Milky coffee is generally served at breakfast along with your meal. Otherwise, café (meaning espresso) is usually served after dessert as the finishing touch to your meal. Technically, café au lait is filtered coffee with milk, served in a large bowl at breakfast but almost exclusively in a home environment. Most cafés will understand what you mean however, and most people will simply swap in a café crème. Poilâne will serve you a giant bowl of café au lait if you sit down in their restaurant and order their whole déjeuner special. It’s not common to ask for half-caff, full-fat vs. low-fat milk, wet vs. dry coffee. Expect blank stares. Sugar is sucre and it’s often served in cubes. French coffee tends to be quite bitter so you may find you use more than you would normally. Sugar substitutes (Stevia, etc.) are rare. Iced coffee is hard to come by. You want to ask for café glacé. Most places will just pour coffee over ice, but we’ve seen some seriously mangled beverages involving coffee flavored syrup. Unless it’s actually on the menu (like at L’Arbre à Café, Coutume or Loustic) or you’re at Starbucks, it’s best to avoid. Milk: There is usually one kind of milk, and it comes from a box. It’s chalky, shelf stable and flavorless. Specialty shops like Coutume will use fresh milk. If you’re looking for milk at the grocery store, you should know that half & half as a concept does not exist. There is red top milk (whole), blue top milk (partially skimmed, 2%), and there is whole liquid cream. Specialty Milks: It’s quite rare to see soy milk, but it can be found at Starbucks and we’ve spotted it at Loustic and Tuck Shop (now closed) as well. Ask for soja (pronounce the j). Nutmilks? Good luck. Can you get milk on the side? You’re welcome to ask for un petit pichet à lait, but don’t be surprised if they look at you quizzically or are not able to accommodate your request. It’s not the culture, and most places don’t have the storage space for tiny pitchers. Big fan of the noisette’s! Paris cafe culture is one of a kind, can’t wait to get back there soon. One of my favorite places in the world. Ordering the right coffe can be a source of difficulty for many tourists, in addition to the so parsian attitude of waiters. Great guide above! So here’s one for the french. I like to understand whether a cafe is going to put one or two shots in my coffee. Most of the places I go will understand “deux shots or un shot”. But what should the true french be for one or two shots? When in Paris, embarrassingly if it’s one of those days that I do want an American coffee, I just go to McDonalds. 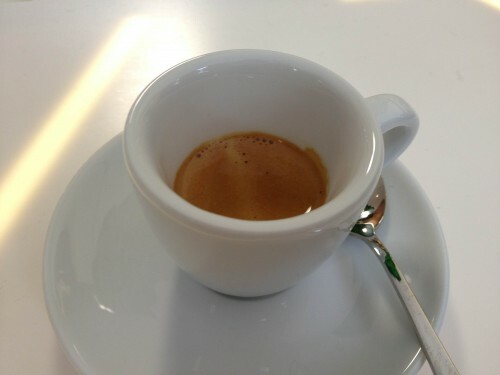 Nothing will be as good as an espresso. It’s usually on a cold rainy day when I am looking for warmth not flavour. Can’t even express how many times I’ve mistakenly ordered “un café” only to be disappointed with a petit espresso. #Fail. I’m so glad I found your site. I’ve been to Paris many times and have always wondered at the coffee attitude I received from some Parisian friends who maligned my American coffee and praised the French. Coffee in the Pacific Northwest where I live is fantastic. 😉 I usually tell them that they haven’t tasted ‘true’ “american” coffee. I typically order a noisette or a creme but have lately found the creme to be well.. universally lackluster. Puzzling the mediocre (or different) coffee one finds here in Paris when the food is so stunning. I’ve been trying coffee shops off your list of best coffee and have so far been either unimpressed–not in a bad way..just no better than I can get back in Portland–or underwhelmed by the prices (expensive). So Far telescope has been the best (over in noodle land near Rue St. Anne). If you have other options or must trys I would love to hear them! Also, what does one do if black coffee or espresso is not to one’s liking? here here, come to paris from half way around the globe to taste the same. As a french parisian, I sometimes read your notes on this site to have a different point of view on what I’m experiencing everyday. So, best is to stick to the Parisian way in Paris to have a real experience, and order a “café”. I personally drink it black and bitter, but you are welcome to add sugar as many of us do ! And what’s not mentioned here, it is also very common to ask for a glass of water on the side “avec un verre d’eau s’il vous plait”. Thanks for deciphering the coffee culture for me! I never seem to get the type of coffee I think I am ordering and always wonder what exactly the different variations mean. Now I think I will be a little more prepared to tackle the streets of Paris and confident to order the kind of coffee I am in the mood for! Interesting. I tried to go and the line out the door of pesky Yankees and Brits was like that for a hamburger at the Camion Qui Fume. Best non-Parisian coffee in Paris? At Holybelly. 19 RUE LUCIEN SAMPAIX – PARIS 10TH. They learned from the best in Melbourne, Australia and have taken it to Paris. I can’t wait to visit it in 2 weeks! Agreed! Italian cappucino is something else and definitely far better than what you get in your bog standard French café. Not just that, but for me, any coffee with milk (or hot chocolate) in Paris is over-priced. Stick to a café espresso… and if you have to have some milk in your drink – try a café noisette which is normally only 50 centimes more expensive. ive just recently started following you and I cant thank you enough for these helpful posts! we go to paris from Australia in April next year and haven’t got much of an idea what’s what. as a tea with soy milk person should I just wait until I come back home fir that beverage?! I would advise against ordering cappuccino in Paris. Perhaps in specialty coffee bars you get the real deal, but the average cafe serves an abomination – a little “useless brown water”, topped with a huge head of foam, finished off with some cocoa powder…twice the price of a cafe creme. Wait till you get back home and go to Starbucks – or Italy!